2nd place: Molly Manzer, Aubry Savannah, Lindsey Wise, Annika Dadowski, Jack Nowicki, Carter Worsley, and Kaden Dreher. Overall Winner of the essay contest was Josie Graper. Josie read her essay aloud to the audience. The Drug Abuse Resistance Education (D.A.R.E.) program is a pioneer prevention effort founded in Los Angeles in 1983. The D.A.R.E. 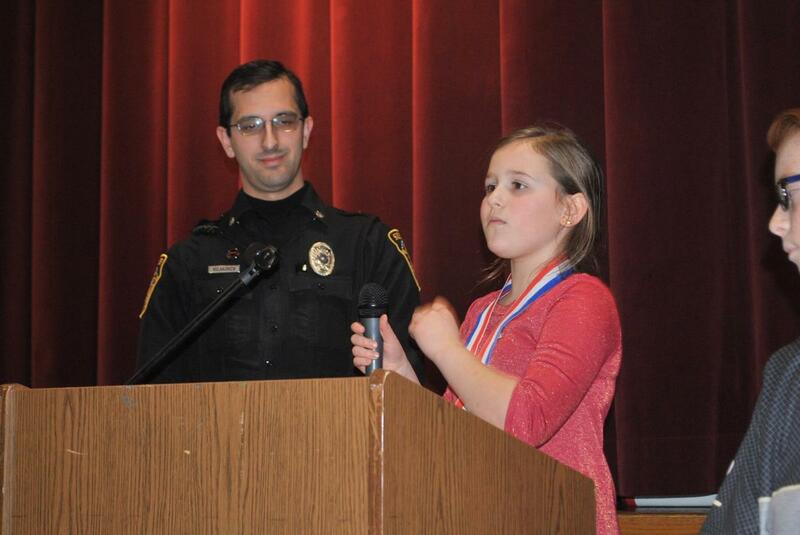 program at the Butler County Sheriff's Office reaches over 1,500 fifth grade students a year; giving each student the skills necessary to make good decisions in the future. Congratulations to all the 5th graders who graduated from this important program! Third Place Essay Contest Winners (front) Noah Musloe, Sarah Buttyan, Jada Burgard; (back) Grace Mayhugh, Gabrielle Goldinger, Officer Bret Vulakovich, Gretta Hull, and Sarah Edder. Second Place Essay Contest Winners (front) Carter Worsley, Kaden Dreher, Annika Dadowski, and Aubry Savannah; (back) Molly Manzer, Lindsey Wise, Officer Vulakovich, and Jack Nowicki. First Place Winners: (front) Josie Graper, Ava West, and Hannah Butler; (back) Aedan Smith, Olivia Carraher, Officer Vulakovich, Zach Szebalskie, and Ciara Santiago Figueroa.